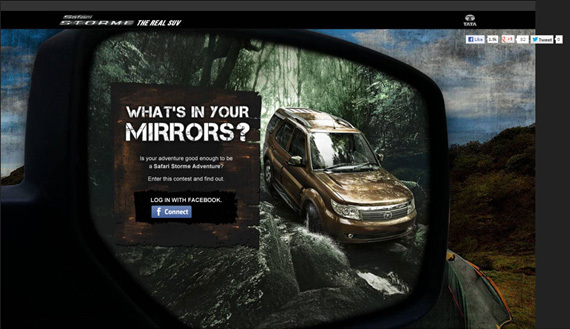 The contest, activated through TATA Safari's Facebook Brand Page and the visually dramatic ‘What’s in Your Mirrors?’ promo microsite, asks fans to submit pictures from their past adventures (the rear-view mirror connection). 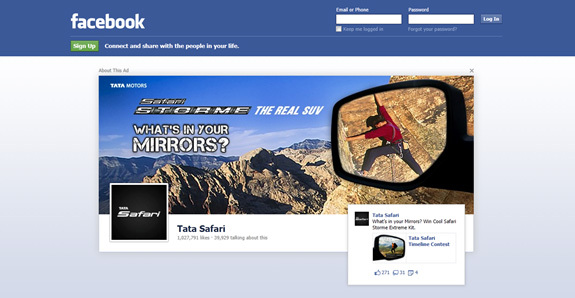 Selected pictures could be featured on the new Safari Storme TVC or be used as TATA Safari’s Facebook Cover Photo. Lucky participants also stand a chance to win Safari Storme Extreme Kits which is a hamper of adventure sport essentials. What stands out across the campaign are striking visuals, imagery and fantastic connected execution across digital platforms. Someone’s doing a brilliant creative job. Labels: Auto, Campaign Update, Campaign Watch, On Facebook, Tata Motors, Tata Safari Storme, The Real SUV, Whats in your Mirrors? If we talk about massive size,rowdy looks and mammoth power Tata Safari Storme is the righteous choice in comparison to the Mahindra Scorpio.Except price,Safari scores higher than Scorpio. What else...Another Safari Storme....What else can follow it.